Sonitrol - Catching Criminals is What We Do! Sonitrol is renown for helping law enforcement identify true security events. This ability is increasingly important as more and more communities adopt Verified Video Surveillance Response Policies ... and our very low 3-percent false alarm rate, coupled with the partnerships Sonitrol has built with local police are why the men and women in blue hurry to Sonitrol alarms ... and not to others. We have the best apprehension rate in the industry (over 175,000 apprehensions to date!). We have the fewest dispatches for false alarms (Less than 3% vs. a 98% from the rest of the alarm industry). We have early detection, full verification and 100% coverage, we make it easy for you to protect your business. Our commitment to service is backed by our unique guarantee. It's something unverified conventional alarm companies simply cannot guarantee! Unlike conventional alarms, Sonitrol's unique verified audio and video security solutions enable our operators to hear and see what is happening in your business before the criminals gain entry - we verify the actual source of the alarm, and we get the police to attend the scene immediately and relay real-time information to the responding officers. If it's a false alarm, we simply reset the system without bothering you or the police. 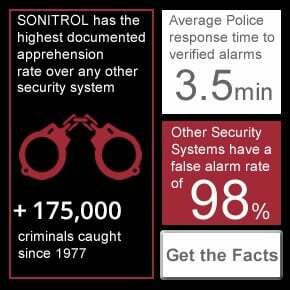 Because of this ability to verify alarms, Sonitrol has the highest apprehension rate and the lowest false alarm rate in the industry. From our "Guarantee and Commitment to Service" to our apprehension record, from our unique audio and video sensors, to our team of experts, we pride ourselves on being nothing like traditional burglar alarm companies. Sonitrol Western Canada provides innovative, integrated security technology with exceptional service to deliver unmatched systems. Hear for yourself the difference audio security makes. We use audio and/or video technology to for 100% coverage of your business - and our staff verify every alarm at our state of the art monitoring centre. A Sonitrol integrated and verified security system doesn't set off an alarm to scare the burglar away (or give them 10 more minutes to commit the crime they intended as they know the police will most likely not have been dispatched). A verified security system leads to faster police response time, more criminals arrested and fewer false alarms. Our integrated suite of intrusion detection, security cameras, controlled access and fire monitoring systems are monitored by highly trained operators in our Central Station. Police Departments across the United States and Canada are continually challenged by the need to respond to all alarms even though, according to the U.S. Department of Justice, a staggering 94 percent to 98 percent of all alarm activations are false. In a post-9/11 world where police departments have been forced to take on additional law enforcement duties and increased Homeland Security responsibilities, the ability to free up time and re-deploy police officers to higher-priority calls has never been more important. Police are turning to Verified Response laws, which require verification of an event before police will respond to the scene, in an effort to reduce the amount of time wasted responding to false alarms. More than 30 cities have adopted Verified Response and many more are currently considering it. Policies vary from one locale to another, but Verified Response generally states that police will respond to an alarm only if it can first be verified through audio or video or by an eyewitness. Without verification of the alarm, it can take police upwards of 45 minutes to respond. A private security guard can verify the alarm, but guards are costly and this approach still can result in delays averaging 17 minutes. With Sonitrol’s audio and/or video electronic surveillance, alarms are verified. The average response time for a Sonitrol alarm is just 3.5 minutes! Our team has the expertise to design, install, monitor and service the integrated electronic security that meets your unique needs. Sonitrol Is A Better Security Alarm! We provide our business clients with unique security technologies and a Gauranteed Commitment to Service. Conventional alarm companies simply cannot match what we offer! LEARN WHAT THE COMPETITION ISN'T TELLING YOU! Performance Warranty: Sonitrol will pay for the first $5,000 of any loss if a forced entry is not detected. Satisfaction Guarantee: We'll refund your installation fee and remove our equipment if you are dissatisfied with our service in the first 6 months. Emergency Service Guarantee: Sonitrol guarantees the on-site arrival of a service technician the same day you call. False Alarm Guarantee: Fine recovery assistance for any dispatched false alarms. Rapid response by Police to Sonitrol verified alarms. Crime Deterrent: With over 175,000 criminal captures, and the highest apprehension rate in the industry, thieves avoid Sonitrol-monitored sites. We're so confident in our technology and responsive service, that no one else in the commercial alarm industry can match our guarantees. 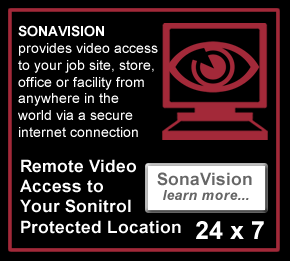 Sonitrol Western Canada Inc. are commercial security experts offering unrivalled security solutions. Verified CCTV / Video and Audio Surveillance Systems provide exceptional alarm protection for businesses, such as construction site security, fenced compound security,retail security, office security, small business security and distribution warehouse security. We specialize in Verified Alarms, Intrusion Detection, CCTV Video Surveillance,Access Control Systems and Fire Alarm Monitoring - Call: 1.866.766.4876. With over 150 offices across North America, Sonitrol is the #1 commercial alarm company in Western Canada serving clients in the provinces of British Columbia BC,Alberta, Saskatchewan and Manitoba, and in Victoria, Vancouver, Edmonton, Calgary, Winnipeg, Surrey, Saskatoon, Burnaby, Richmond, Coquitlam, Regina, Saanich,Langley, Delta, Strathcona County, Kelowna, Red Deer, Kamloops, North Vancouver, Nanaimo, Lethbridge, Chilliwack, Abbotsford, Maple Ridge, Prince George, New Westminster, Wood Buffalo, St. Albert, Fort McMurray, Medicine Hat, Port Coquitlam, Grande Prairie, Lower Mainland, Northern Alberta, Southern Alberta, and all communities inbetween.